What are the necessary measurements? What formula does the US Army body fat calculator use? There are a few ways of determining the fat content of a person's body, and among them the method developed by US Army that calculates body fat with good precision. This parameter is estimated for all service members of the US Army since they are required to meet the army percentage body fat (%BF) standards as a condition of military service. 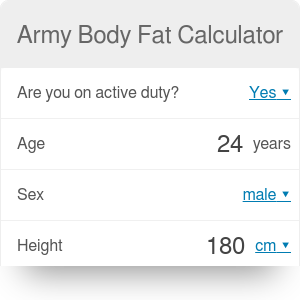 Calculate your body fat and scroll down to check if you could join the army. The US Army body fat calculator uses a different formula to the method provided in our US Navy body fat calculator and body fat calculator, so you might also want to check them out. Height - make sure you don't wear shoes and stand up straight. Neck - measure its circumference below the larynx (Adam's apple). Waist - measure it at the at the navel level for men, and around the narrowest part of the abdomen for women. Hips - this measurement is needed for females only and should be taken at the widest part of the buttocks or hip. You can input the values in both metric and imperial units. Having taken these measurements, you can use them to find your body shape. The equation is described in the Army Regulation 600-9 - The Army Body Composition Program. Please note that the formulas presented above are designed to work for values in imperial units. Age over 40 - 26% for males, 36% for females. Army Body Fat Calculator can be embedded on your website to enrich the content you wrote and make it easier for your visitors to understand your message.